KitchenAid Commercial Stand Mixer geared for high-end performance, engineered by the legendary, internationally-acclaimed experts. This bowl-lift stand mixer raises bowl for stable mixing and lowers for easy removal. Certified for commercial use by the National Sanitation Foundation (NSF). With 1.3 horsepower direct current (DC) motor, this Kitchenaid NSF stand mixer is a powerhouse that runs cooler, yet is quiet in operation. Large 7-quart capacity and 10 speeds, with the full range of commercial abilities to knead large quantities of bread or pizza dough, heavy cookie batter or whip egg whites to perfection. Electronic speed sensor maintains selected speed regardless of load. With 16-cup flour power, this stand mixer accommodates the amount of dough to knead 6 loaves of bread or blend batter for 14 dozen cookies. Planetary action allows attachments to spin independently for thorough mixing. Equipped with an electronic speed sensor, this KitchenAid stand mixer maintains speed regardless of load. The commercial stand mixer attachment hub powers all KitchenAid attachments, residential and professional, for limitless versatility and convenience. Rugged, zinc die-cast all-metal construction provides the sturdiness required to support the intense power of this machine. 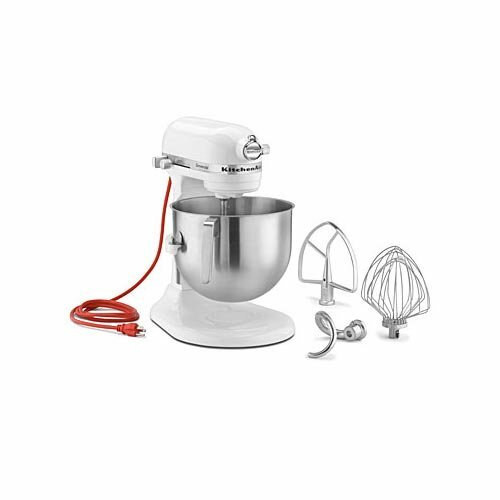 Includes: 7-quart stainless-steel mixing bowl, elliptical whip, wide flat beater and dough hook. The Powerknead spiral hook kneads yeast dough, and the professional wire whip attachment with additional tines ensures maximum volume while whipping cream or egg whites. Commercial-style handle makes this 7-quart easy to use and store. Heavy-duty metal knobs for durability and thick 71"L commercial power cord for professional kitchen use. Bowl is dishwasher-safe. White. Made in the USA. Since the first stand mixer was introduced in the early 1900s, the KitchenAid brand has been acclaimed internationally for performance.